ACR is a professional organization dedicated to enhancing the practice and public understanding of conflict resolution, created in 2001 by the merger of the Academy of Family Mediators, the Conflict Resolution Education Network, and the Society for Professionals in Dispute Resolution. Today, ACR serves a diverse national and international audience that includes more than 6,000 mediators, arbitrators, facilitators, educators, and others. All who are interested in the organization's mission are welcome to join, regardless of current involvement in the field of conflict resolution. NEACR is truly honored to have been named 2018 Outstanding Chapter of the Year. 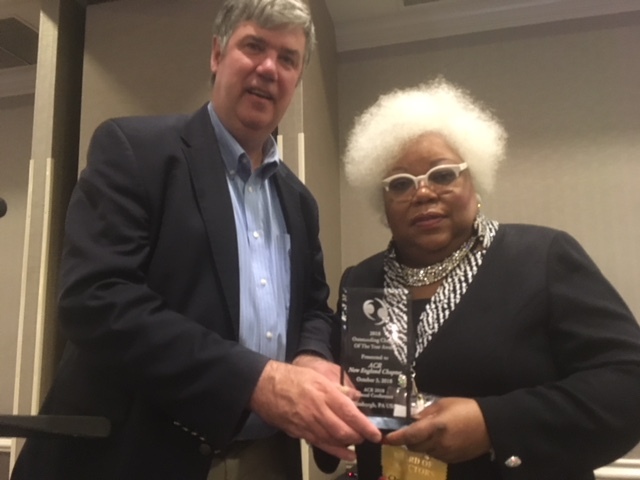 This award was presented to James Kerwin, current President of NEACR, at the October 2018 ACR Conference in Pittsburgh, PA. Thank you to all of the members, board of directors and regional practitioners whose contributions to the organization make NEACR the outstanding chapter that it is. And a special thanks to ACR for the gracious recognition! Are you interested in contributing to the success of NEACR? Click here to join, or send us your questions, comments and suggestions via email.